….Women are nearly 50 percent more likely to work in the public sector than are men with 18.2 percent of employed women working in public sector jobs…. ….The unemployment rate averaged 8.6 percent among women in 2010. Data for March 2011 shows that the economic situation is improving for women, who have seen their unemployment rate decline to 8.3 percent. However, while the private sector has added 1.7 million jobs over the past 12 months, the public sector has lost nearly 400,000. Since women are disproportionately likely to work in the public sector, their unemployment decline has been smaller than that experienced by men. The unemployment rate for men averaged 10.5 percent in 2010 and has declined to 9.3 percent in March 2011. However women continue to have a lower unemployment rate than men, are less likely to be long-term unemployed, and have a median duration of unemployment that was 1.9 weeks shorter than men’s in 2010…. There is the small matter of the Bush recession continuing until economic recovery programs, you know, like the American Recovery and Reinvestment Act of 2009 started to kick in. Representative Hartzler: Yeah, good point. Uh, the, as far as federal employees, uh, yeah, it has grown exponentially, the number of federal employees. I think if you’re gonna see some real change there, uh, we’re gonna have to take a, see some changes in the Senate next year and the White House in order to get that through. But, uh, it, I agree, there’s some, there’s a lot of areas in federal government that we don’t need. They should be, even according to the Constitution there’s only a few things that government should be doing. And the rest could be done at the state level , or the local level, or by private industry, or private citizens and, uh, we’ve got to get back to the original intent of what our founders wanted. And I think that’ll help take care of some of our debt crisis. Voice: For, for, could you give some examples? Representative Hartzler: So, let’s go, yeah [crosstalk]…. Women work in disproportionately higher numbers in the public sector. The federal government is a public sector employer. Vicky Hartzler, like almost all republican politicians in this day and age, advocates cutting public sector employment. Voila! Blame President Obama (D) for the number of unemployed women. Even though private sector employment has increased. 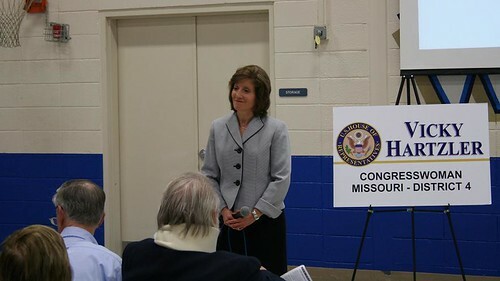 Representative Vicky Hartzler (r) in Blue Springs, Missouri, listening to a question from a constituent at a town hall on April 28, 2011. ….There were fewer federal workers in 2009 than in 1990, 1980 and 1970. Now take a closer look at the OPM table. Much of the growth, understandably, occurred in Homeland Security agencies, increasing from 70,000 to 180,000 – a jump of 110,000. Justice Department jobs went from 98,000 to 113,000 — more than 15,000 new jobs added. (Again, crime and more Homeland Security related.) Jobs at the Veterans Department increased from 220,000 to 297,000 — that’s 77,000 more federal workers. Again, a result of Homeland Security, or rather staffing up to take care of thousands of veterans coming home from two wars. And there’s a lot of information technology jobs in there. So, taking those three areas, the number of new jobs created in the last 10 years, which can be traced back to 9/11, was 202,000. That by itself accounts for nearly two-thirds of the total federal workforce growth from 2000 to 2009, which was 316,000 jobs. Hold those steady since 2002 (or even allow for some growth), and you would have less than 1.9 million workers in 2009, or slightly more. That’s about the same number of federal workers in 1962, the year Shlaes chooses as her benchmark to compare the number of government jobs to the number in the private sector (with public sector jobs accounting for an eighth of all jobs). Remember, that was before the Great Society programs geared up, popular programs that needed a slew of federal managers and clerks to oversee. By the way, the number of jobs at the Interior, Transportation and Treasury departments fell from 2000 to 2009. And those at Health and Human Services, Education and the Social Security Administration grew from 1.26 million to 1.39 million — 130,000 jobs over 10 years, or about 13,000 new positions a year as the health industry expanded at a torrid pace…. Yeah, check out that “exponential” growth….